In the decades after the U.S. Civil War (1861-1865), Republicans were often accused of 'waving the bloody shirt'--reminding voters of Southern secession, and urging them to vote for the party of the Union and Lincoln. These appeals held enormous appeals to those who had made great sacrifices in the Union war effort: veterans, including men still suffering from injuries and diseases contracted in the Army; those who had lost husbands, sons, and fathers; former nurses and volunteers; Southern African-Americans emancipated by the war; and Northerners, black and white, who had sought to abolish slavery. Former Confederates, of course, dismissed such appeals, as did many Americans who emphasized 'sectional reconciliation' between North and South. And Americans who wanted to move on to new issues argued that, by 1896, the war had been over for decades, and Republicans were failing to develop new ideas and initiatives to meet the nation's changing needs. Not surprisingly, veterans played a major role in the campaign and McKinley's status as a veteran was widely stressed in the Republican press. He was, in fact, the first Republican president since Lincoln who was not a former Union General (being young, he had only attained the rank of Major before the war's end). The ghost of Lincoln appeared in a number of cartoons; Populists and Socialists as well as Republicans often sought to claim his legacy of federal activism. Images of slavery appeared in many cartoons during the campaign. The plight of African-Americans, however, and the growing problems of race prejudice, disfranchisement of black voters, Jim Crow segregation, and lynching, received almost no attention from white voters and the mainstream press. Rather, 'slavery' served most often as a metaphor for the plight of the white working-class--or in Republican cartoons, for Bryan's proposed 'sale' of the national credit. Republicans also branded the so-called 'anarchy plank' in the Chicago Platform a sign of secession sentiment among Democrats, who counted many white Southern supporters. The Union generals who are speaking for McKinley made a lively trip through Ohio today. Leaving Canton at 8 o'clock, the first stop was at New Philadelphia, where speeches were made to a large and enthusiastic crowd.... The special train ran to Steubenville. Gen. Sickles made the chief speech to a big meeting. The potters turned out at East Liverpool to greet the party and much enthusiasm was displayed. At Youngstown there was the largest meeting of the day. Gen. Howard made the principal speech, and was loudly applauded. The next stop was at Warren. The train arrived there two hours late, but the big audiences which had assembled in Central Armory waited patiently until the old soldiers arrived, and gave them a great ovation. --Los Angeles Times, 20 October 1896. WHAT THE SOUTH SURRENDERED AT APPOMATTOX REGAINED AT CHICAGO. Power Wrested from Her by the Sword Restored Through an Aliance with the West. The Chicago platform of the Democratic party seeks to interfere with private contracts and to revive the old doctrine of State resistance to Federal authority.... If these men know what they are doing they certainly intend to reorganize the institutions of this country. Should they be elected and attempt to carry out this plan, they will find no less than 4,000,000 to 5,000,000 armed soldiers to resist it. We will do as men did in 1861. We asked simply then that the constitution which Washington and others framed should be preserved, and we are going to defend it now. If nothing else will do them, we will defend it as we did in 1861-1865, and there are men who will bring Mr. Bryan and his cohorts in as prisoners of war as they did Jefferson Davis. McKinley Serving Hot Coffee To His Regiment In the Thickest of the Battle at Antietam. from Lives of McKinley and Hobart. Not since 1860 have the platforms of the contending parties presented an issue so signally made, so clearly and sharply defined. There is no occasion for mistake, no chance for deception.... The platform is silver, the candidate is silver. The plutocracy has once more usurped control of the Government.... Once more the millionaires of the country are in the field openly asserting that property has a divine right to rule manhood and that it is treason to deny it.... The issue against African slavery was never so vital nor so sharply defined as this. Resolved, further, That we pledge to him our united support and our votes to elect him to that high office, and we earnestly call on all our comrades and their sons wherever they may be, to stand by Comrade McKinley with us in the present struggle for the nation's honor and credit, as in the past we stood shoulder to shoulder in defense of the nation's unity and integrity in the great war of the rebellion. The same principles that made me a Republican in the early days, have today made me a Populist, and I'll tell you what they are. I remember when I was a little boy my parents were the old line abolition kind of people that believed in equal rights to all and special privileges to none. . . . We took a little paper called Uncle Lucas Child's paper, and one side of the paper bore a motto about the size of a coin in the centre of a picture--a picture of an African slave with his hands uplifted and in chains, and around the rim of the coin a motto, "Am I not a man and Brother?" That made a wonderful impression on my mind. I was taught thus in my infancy . . . to stand for the weak against the strong, for God knows the strong can take of themselves. And I say now, it is the duty of government to protect the weak.
. . . I believe, and I say it freely, that the working men and women of this country, many of them, are simply today in the shackles of industrial slavery. African-American soldiers burying bodies of fellow soldiers who had died in the battle of Cold Harbor, Virginia, the year before. 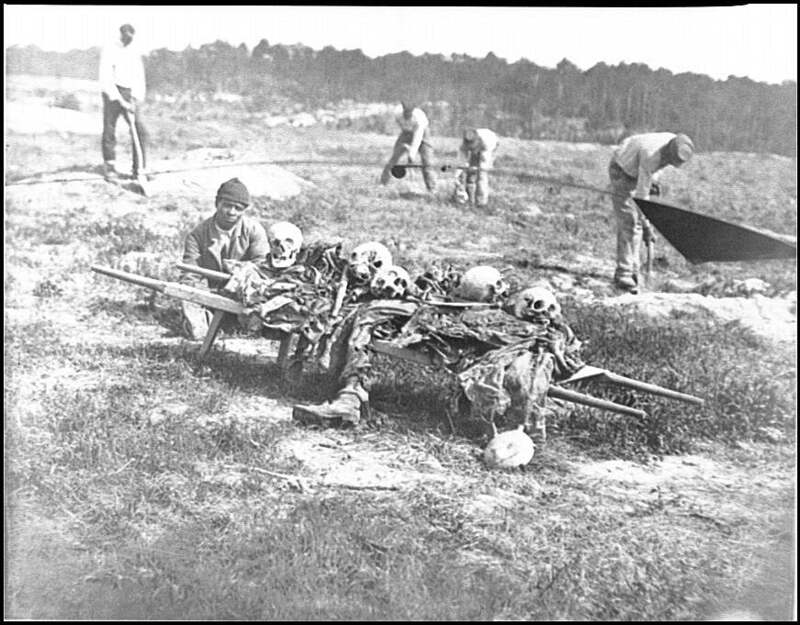 White soldiers and Southern civilians often refused to bury black soldiers whose bodies were left on the field. Taken by John Reekie, 1865. From the Library of Congress American Memory website.